Blogs are web logs which are updated regularly by their authors. It usually contains helpful information and instruction about a specific topic or thing that you want to know deeply. Additionally, most blog articles have embedded videos which can help readers to fully understand what the article is trying to deliver. As a blog reader, you might enjoy the video (whether it be a funny, dramatic, or informative) embedded in the sites like Tumblr, Facebook, Vine and many others. Or you might want to share it with your friends. However, most of the time, videos embedded on blogs become unavailable due to copyright infringement. Given this, you need to download video from blog and keep them in your computer for future sharing and viewing. Consequently, most blog sites do not have the option of downloading the video. However, you may rely on the third-party tools to download such videos. Methods are listed as below. If you are a Firefox user, it will be easier for you to download embedded videos on a blog. All you need is an extension called Greasemonkey that is only available for Firefox browser. You may try this method by following the steps below. 1. Download, install the extension Greasemonkey, and then relaunch your Firefox browser. 2. You need to choose “Tools” on the main menu and then choose “Install user script”. 3. Open the extension, and then click OK when a plain text file appear. 4. Now go to the blog site where the video is embedded. Hover your mouse above the video. Click it to download the video. b. Users do not need any installation in their computer. a. The extension is only available on Firefox. Chrome and other browsers users will not be able to access it. b. It is a bit tricky to use and install. No matter you are a Firefox user, or in case you don’t feel like using the Firefox extension, it is suggested that you use Video Grabber tool to process blog video download. It is an online tool which lets users download any video from different sites. All you need to do is to copy the link of the blog site (with embedded video) and then paste it in the URL box found in the Video Grabber webpage. After that, click on the “Grab it” button and then click “Download” button which you can find beside the output format that you want. The video will then be downloaded in your computer. In addition to that, this downloader can also help you to convert video to another video format or video to MP3 file. That being said, you don’t need to install or look for another online application to that for you. Below are the pros and cons of the downloader. a. It is free and easy to use. b. It can download as many videos as you want. c. No need for you to install anything in your computer. a. It cannot download multiple videos at once. b. It sometimes takes more time to download lengthy videos. c. Since it is an online tool, we cannot erase the fact that sometimes, the website is down for downloading. Another amazing downloader that you can use is the Video Download Capture. Compared with the above tools, it features easy operation, user-friendly interface and complete functions, which actually serves as a video downloader, converter, player and search engine. 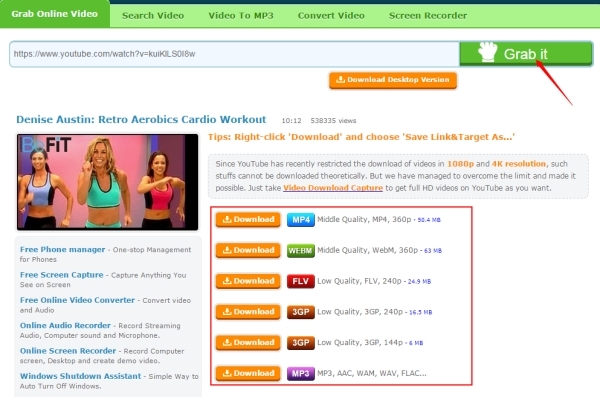 To know how to download videos from blog using this program, review the steps that follow. Download, install and launch the application in your computer. Copy the link where the video is embedded and then paste it in the URL box found on the interface of the tool under “Download” tab. Choose the video output format that you desired once a new window pops-up. The video will start downloading at an accelerated speed. Moreover, this tool has a video detector which detects videos automatically. Just simply find link of the blog site where the video is embedded and the tool will automatically add it to the download tab. The Video Download Capture tool has also a built in editor where you can edit, trim and crop videos. It even has a built-in converter which can help you in converting any video file into other formats. a. It can automatically download a video. b. It has a converter and editor. c. Can download multiple videos at a time. a. It needs installation to computer. b. A bit slow when downloading multiple videos. Although most blogging sites do not allow readers to download videos directly, it has been simplified by the video downloaders like the Video Grabber and Video Download Capture tool. However, the third method is recommended because it allows users to easily download videos by means of its detector and some other helpful functions.